If you don’t already have enough reasons to attend the upcoming 5th Annual Winter Indie Wed, let me give you one more! Similar to last year’s event we will be transforming the entire 3rd floor of the Ravenswood Event Center into a lounge for attendees to relax in between visits with vendors below. I asked local event planner (and Indie Wed alum) Carlene from Naturally Yours Events to plan this year’s lounge. After some serious brainstorming, we are excited to introduce…. Interested? Well let me tell you more! 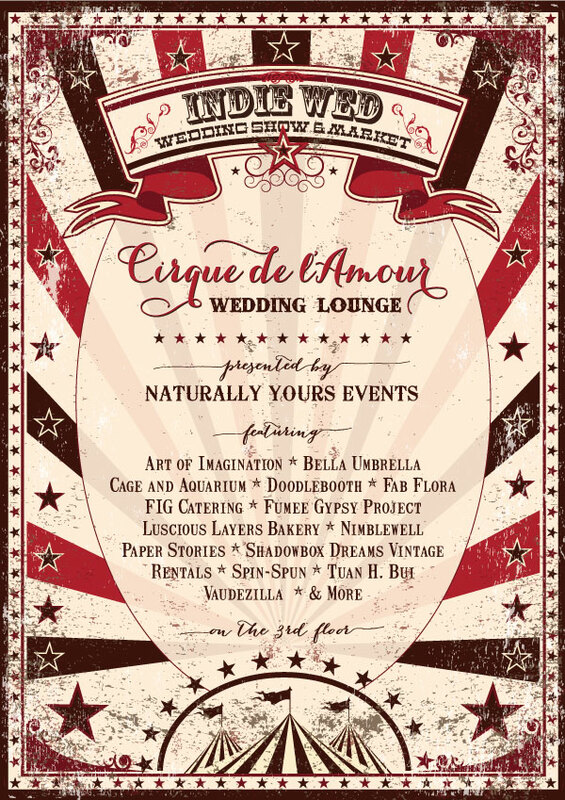 Inspired by an era where Vaudeville shows and carnivals provided entertainment and glamour, Carlene with Naturally Yours Events is bringing all the romance and whimsy of a vintage circus to Indie Wed! Imagine relaxing under the big top of twinkling cafe lights and ruffled parasols or cozying up with a craft cocktail on a vintage settee. Enjoy performances that will spark wonder and music that will whisk you away to a Parisian jazz lounge. Sample circus themed bites and decadent sweets before puckering up in a handmade kissing booth. Casually chat will vendors and other guests or test your skills at our carnival inspired games to win some prizes for your big day! Best yet, all these vendors are committed to being eco-friendly both professionally and personally. This lounge is a perfect retreat for both guys and gals to relax, meet cool vendors, and be inspired. To entice you just a bit more, here is a list of the amazing vendors who will be participating in the lounge. Many of them also have booths on the first and second floors as well (denoted by *). Art of Imagination will magically transform the 3rd floor space with beautiful draping and lighting, utilizing the eclectic bunch of parasols from Bella Umbrella. Fab Flora* will add a touch of romance with textured florals in burgundy and blush. Vintage couches, settees, trunks, and gorgeous furniture will be provided by Shadowbox Dreams Vintage Rentals. Nimblewell* will work with Luscious Layers Bakery* in providing rustic crates and vintage platters for all their yummy baked goods to sample. What would a carnival be without cotton candy? Our friends at Spin-Spun will be whipping up their all natural cotton candy to enjoy. FIG Catering is working on a menu that is sure to dazzle and will be providing the perfect libations for this soiree. We heard a rumor of craft cocktails! Fumee Gypsy Project will be on stage and Doodle Booth* will be providing hand drawn caricatures. Vaudezilla will dazzle and delight guests with vintage inspired can can performances. Cage and Aquarium* will put together the perfect playlist while our performers are on break. Paper Stories is designing all the signage and paper goods to pull in all the details, while Tuan H. Bui Photographer captures some amazing photos to document our fantastic lounge. Don’t forget to hop behind the kissing booth and say hello to the gal who put this all together, Carlene of Naturally Yours Events. So if that doesn’t sweeten the pot even more, I don’t know what will. This year’s show is going to be amazing and this will be just one more reason you will be glad you came. Tickets are on sale now. Visit here to get yours while they are still available. Hi. Actually we designed it ourselves. Then we used an awesome guy to code it and do all the backend stuff for us.